For a modern spin on a traditional tealight, we have incorporated a stacked "LOVE" design on the front of this candle base. 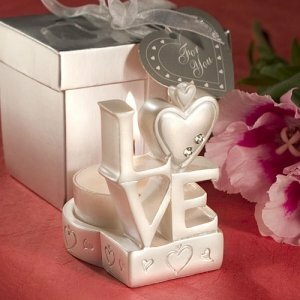 The candle wedding favor is made of pearlized white resin and features a number of heart cutout designs surrounding the base as well as a heart-shaped O in the word "LOVE". The unique stacked design matches perfectly with our Stacked 'Love' Design Place Card Holders (see item FC-8105), and makes an enlightening gift for your guests! Embellished with two rhinestones and an extra "stacked" heart on top, each 1 3/4" by 2 3/4" candle holder includes a clear glass and white wax tealight and comes packaged in a silver gift box with white organza bow and matching heart-shaped "Thank You" tag. Are the boxes included, if not how do I order them. As the tags and can I personalize the tags and add a picture of the couple on the top of the box? 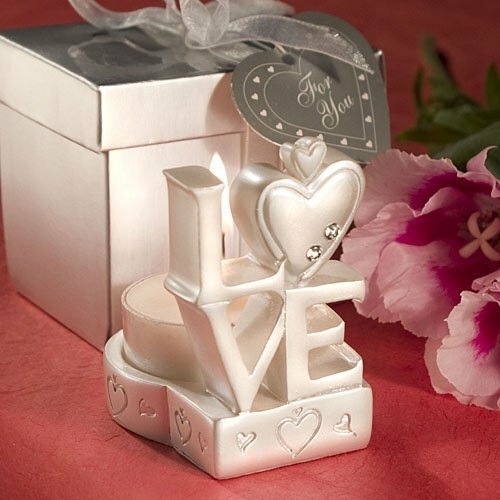 Yes, the Stacked 'Love' Design Candle Wedding Favor comes packaged in a silver gift box with white organza bow and matching heart-shaped "Thank You" tag. I'm sorry personalization is not available for this item.